The satirists are getting a lot mileage out of Mahmoud Ahmadinejad's declaration that Iran is gay-free. Last week, Saturday Night Live spoofed Ahmadinejad, as we noted. 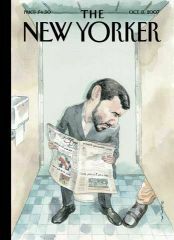 Then, The New Yorker parodied Ahmadinejad on the magazine's cover with one of its famed cartoons. (The image included a not-so-oblique reference to Larry Craig, the conservative US Senator who recently got caught up in some mens' room high jinks. Unfamiliar readers can get the scoop on Craig here.) Of all the inane comments Ahmadinejad has made, and there are many, it's interesting that the satirists have chosen to focus on this one. Denying the existence of gays in Iran is no more empirically absurd than denying the Holocaust. So why the emphasis on the sexuality comment? Because Ahmadinejad has been playing the anti-semitism card for some time, but the homophobia card is relatively new, hence making it worthy of attention? Or is it because sexuality offers an always convenient way to take a political enemy down a peg? Or since there's no good way to satirize a genocide, perhaps sexuality becomes a good default. Ok, I'm stumped. Note to self: think twice next time before over-analyzing jokes. Speaking of jokes, make you check out the footage we posted of Woody Allen doing standup in 1965.